This all-suite beachfront resort in Arena Gorda offers a sumptuous vacation experience amid gorgeous surroundings. Spacious suites feature indulgent amenities such as Jacuzzis, with some offering swim-up access. The resort offers 13 pools, 5 Jacuzzi's, a fitness center and a spectacular spa. Opening December 2016. Located next door to Majestic Elegance in Punta Cana. 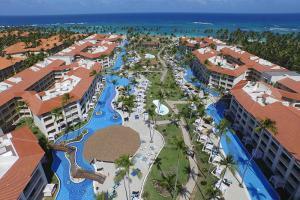 About 15 miles away from the Punta Cana International Airport. Buffet and a la carte options for breakfast, lunch and dinner. 8 restaurants (6 of them a la carte), unlimited visits.